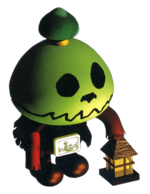 Hobgoblins are undead enemies that inhabit Kero Sewers in the game Super Mario RPG: Legend of the Seven Stars. They wear ragged clothing and carry lanterns, making them resemble the Lantern Ghosts from Super Mario World 2: Yoshi's Island. Hobgoblins also slightly resemble scarecrows. These enemies never fight by themselves; they always accompany other enemies like Rat Funks, The Big Boo or Shadow. In battle, Hobgoblins attack by clawing their opponents. Additionally, Hobgoblins can use a number of magic spells that cause status ailments. One such attack is Dark Claw, which Poisons one of Mario's allies and causes 50% more damage than their normal claw attack. The other is Elegy, which Silences a party member, making them unable to perform special attacks. Since they are undead, Hobgoblins can be instantly destroyed with Pure Water. Hobgoblins are considered the relatives of the Straw Heads from the Sunken Ship. Hobgoblin is a term often applied in folktales as a friendly but troublesome creature. This page was last edited on March 5, 2019, at 16:12.